This is a unique product for the fact it only contains cards of 18 different players. When you open the outer box on this product, there will be a window to show you which player is featured in the box. Since all cards in the box are of the same player, and you get an autograph – seeing Michael Jordan or LeBron James will be great. 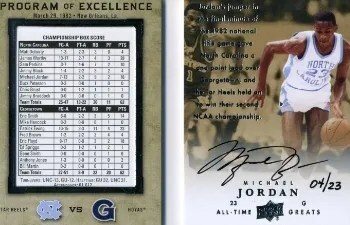 Michael Jordan Autographs are inserted at the rate of 1:6 Boxes.